Nutrition is cornerstone of the chiropractic lifestyle. Dr. Hoch educates patients about wellness-focused eating-and helps to distinguish nutrition facts from nutrition trends. Yogurt seems to be touted as a health food, but is it? First, let’s talk about how is yogurt created? No matter how it ends up, all yogurt starts out by adding two types of bacteria, Lactobacillus bulgaricus and Streptococcus thermophilus, to milk (collectively, these bacteria are known as acidophilus). The combination is warmed for a few hours, during which the bacteria convert milk sugar (lactose) to lactic acid, which curdles the milk and gives it a distinctive, pleasant, tangy flavor. What happens next determines the fate of the bacterial cultures. Additional blends of bacteria such as Streptococcus salivarius subsp. themophilus and Lactobacillus delbrueckii subsp. Bulgaricus. These are supplemented with lactic acid bacteria, including Lacobacillus acidophilus, Lactobacillus casei and Bifidobacterium, all of which improve the taste of yogurt. Flavorings and other additives may be a part of the recipe – some of which offer health benefits and some of which may contain components that are destructive to well-being. People have been making and eating yogurt for more than 4,000 years. With its high calcium and protein content, yogurt is considered a staple food in many parts of the world, from Asia to Eastern Europe, and is often associated with longevity. Aside from it basic nutrients, what makes yogurt such a wholesome food? The lactic acid, which prevents the formation of “bad” bacteria, also preserves the “good” bacteria in yogurt. Dr, Hoch wants patients to know that “good bacteria,” called probiotics, have a myriad of benefits. In 2006, a scientific analysis of probiotics, defined as non-digestible, lactic acid-producing bacteria like those in yogurt, showed that they boost intestinal health enhance the immune system, improve the bioavailability of nutrients, reduce symptoms of lactose intolerance, decrease allergies and lower the risk of certain kinds of cancer (J Appl Microbiol 2006;100:117-85). That’s an impressive list of advantages for such a humble food. The correct balance of good and bad bacteria in the gastrointestinal (GI) tract keeps the immune system operating at top capacity. Yogurt has long been known to be advantageous for gastrointestinal health. According to scientists, consumption of the bacteria contained in yogurt lowers the risk of contracting stomach infection in the lower GI tract (Am J Clin Nutr 2000;71(6Suppl):1682S-7S). For individuals with severe stomach problems, yogurt can be much more than a tasty between-meal snack. A new Canadian study tested the effeccts of regular yogurt comsumption in patients diagnosed with either inflamatoty bowel diseas or Chron’s disease. Reasearchers determined that eating probiotic yogurt for one month provided significant anti-inflammatory proerties for those patients (Clin Exp Immouno 2007;149:470-9). A general rule of eating for health maintains that the less food is altered, the more nutritious it is. This principle is definitely true for yogurt. However, producers of bulk products need their foods to have a better shelf life. To achieve this they often heat-treat (pasteurize) yogurt after fermentation. This kills off the live cultures. The Food and Drug Administration (FDA) requires that these products be labeled “heat-treated after culturing.” To determine whether the yogurt you buy contains living bacteria we should be able check the labels for the words “active yogurt cultures,” “living yogurt cultures,” or “contains active cultures.” But, don’t be fooled by the words “made with active cultures.” All yogurts are made with live cultures, but no live cultures survive heat-treatment. You can keep yogurt containing live cultures in the refrigerator for about two weeks. If mold and gas bubbles form, throw it out. But don’t worry about greenish or clear liquid floating on top, this is the whey or liquid component of yogurt, it’s harmless and can be stirred in before eating. The truth is, most yogurts on supermarket shelves probably don’t have the beneficial “live” or “active” cultures typically found in yogurt in countries such as Greece, Israel, Lebanon, or India. In fact, much of the custard-textured products sold in this country bear little resemblance to traditional yogurt containing live cultures, which I much prefer. Traditional is healthier, because it doesn’t contain the sugars found in flavored yogurts, and because the live cultures help maintain “friendly” bacteria in the digestive system. Since labels can be deceptive, here’s a way to identify if a yogurt has been pasteurized after culturing: it will have a smooth pudding like consistency. If this is the consistency of the yogurt you are eating – it doesn’t have any beneficial live cultures. Yogurt containing active cultures also aids digestion for people who are considered lactose-intolerant. Unfortunately, pasteurization eliminates the enhanced digestion of lactose that is one of yogurts primary benefits, and kills helpful live cultures (Am J Clin Nutr 1989;49:823-7). 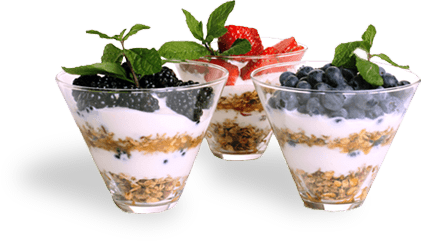 There is an immense array of yogurt products available: Yogurt in single serving cups, yogurtin child-friendly tubes and even drinkable yogurt. Consumers need to be on the lookout for yogurt with unhealthy additives, especially sugar and artificial flavors. Milk naturally contains sugar as lactose. When you look at the nutritional facts panel for a yogurt product, lactose content will be listed as sugar, and that’s OK. Naturally occurring lactose is processed by the body differently than table sugar or sucrose. The trouble comes when you choose yogurt with a lot of added sugar. These yogurts can have as much, or more sugar than a candy bar or full-sugar soda. Be sure to investigate the ingredients list, and avoid the varieties sweetened with anything other than whole fruit or honey. Also avoid varieties with artificial flavorings, preservatives, artificial sweeteners and other chemical additives. While there is no RDA for sugar, the U.S. government officially advises us to consume no more than 40 grams (10 teaspoons) of sugar per 2,000 calories. A quick label check at the grocery store reveals that many yogurts contain 30 to 40 grams of sugar in one single serving! It’s important to confirm that the calories in your yogurt come from the yogurt itself and not from sugar, or worse, from high-fructose corn syrup (HFCS) The consumption of HFCS increased more than 1,000 percent from 19700 to 1990. Today, HFCS accounts for more than 40 percent of all caloric sugars (Am J Clin Nutr 2004;79:573-43). A high intake fo HFCS is linked with a variety of all caloric sugars (Am J Clin Nutr 2004;79:537-43). A high intake of HFCS is linked with a variety of disease processes, especially in children. Tired of yogurt? Try kefir. Kefir is a fermented milk product, similar to yogurt but more liquid in consistency. It often contains more bioavailable “good” bacteria than yogurt products, and is beneficial for those with lactose intolerance or digestive problems. Kefir is sour, and may be made more palatable by blending with fruit, honey or molasses. The Bottom Line: Yogurt is more than hype. It does indeed have a powerful health benefits – if you read labels carefully. Try to choose yogurt that is minimally processed and contains a minimum of ingredients. Stay away from low-fat options as they replace the fat with sugar and additives to improve consistency. Even yogurts that do contain live cultures are not considered high enough in probiotic to be considered therapeutic medical foods. So, if you have a bladder infection, yeast infection or digestive complaint that requires attention, you should supplement twice daily with a good multi-strain pro-biotic, as the cultures in the yogurt will not be enough to fight the infection. If you’ve never tried yogurt, do so and you just might find a nutritious new snack that satisfies your hunger, and is good for your health. ⟵Spring Season and Acupuncture: What’s the Connection?